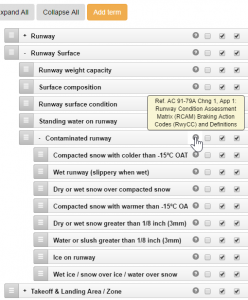 Airports have their own unique SMS requirements that include perimeter security, wildlife control, runway condition assessments, etc. OmniSMS is well-suited to address these needs with configurable and customizable taxonomies. 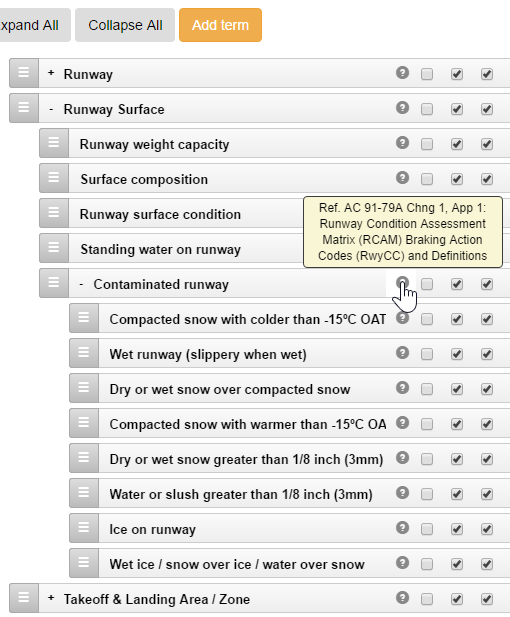 For example, 2016 saw a change to Advisory Circular AC 91-79A (Chg 1 App 1) which revised terms and definitions for runway condition assessments and braking action codes (RwyCC). Within OmniSMS, airport administration staff simply added these new terms and definitions to their runway condition taxonomy. This can be done with all OmniSMS taxonomies, in order to keep the system aligned with current standards and regulatory requirements. OmniSMS™ has built-in ‘liferings’ and information icons which prompt and remind managers how to investigate and discover root causes, assess risk, develop effective Corrective Action Plans, and know if they are the appropriate risk-decision authority. With OmniSMS you can create, view and print Safety Risk Management Process Reports. Take these reports to meetings or send as an email attachment in PDF format. Managers can also schedule, track and perform follow-up audits on vendors, to ensure that implemented risk controls are conforming and remain effective. The Communication of Lessons Learned (CLL) Report is also easy to print, email, or otherwise distribute as an essential part of your safety promotion efforts. Move beyond proactive safety risk management to predictive trend reporting. OmniSMS allows you to see trends in reported occurrences and other user-specified fields. OmniSMS supports data export to Excel to create graphs, pie, and bar charts. Ask to see a demonstration of OmniSMS for Airports today.